Yes. Now you have your administrative login details, we would be taking a quick dive into what and how these credentials can be used to help you begin the automation of your key HR processes and managing your team effectively. 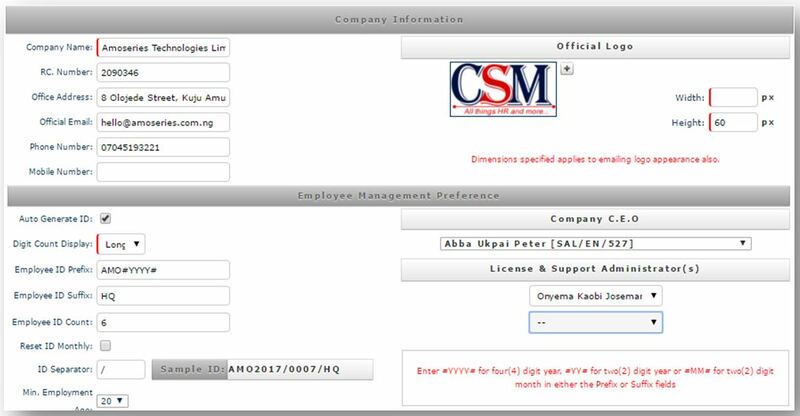 To begin, open your browser and type in the address csmanager.com.ng. The page displayed is the landing page from which this entire tutorial would be done. You would be presented with three fields required to login. Fill in the details as received with your administrative credentials sent to you. This credential would be used only for the initial setup phase. 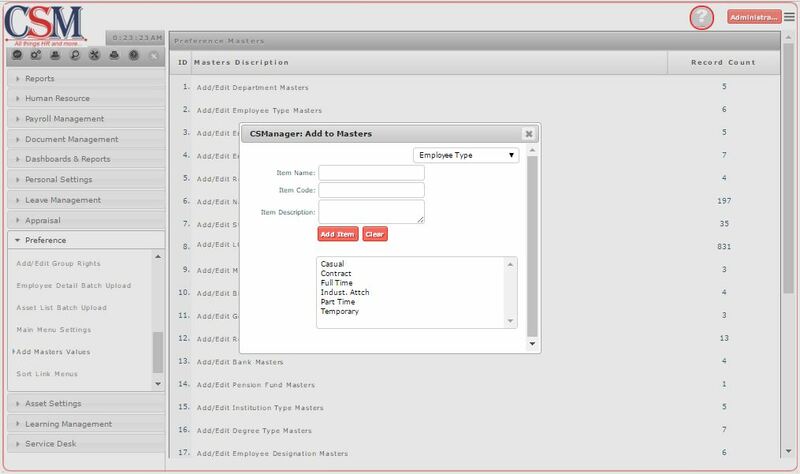 Once your employee credentials are configured, you would no longer need to use the administrative credentials anymore. Once logged in, you are presented with a screen as the one displayed here. The points have been marked to make for easy identification. Main Menu: Here you have a list of all menus that you have assigned privilege to. Note: not all users can see all menus. 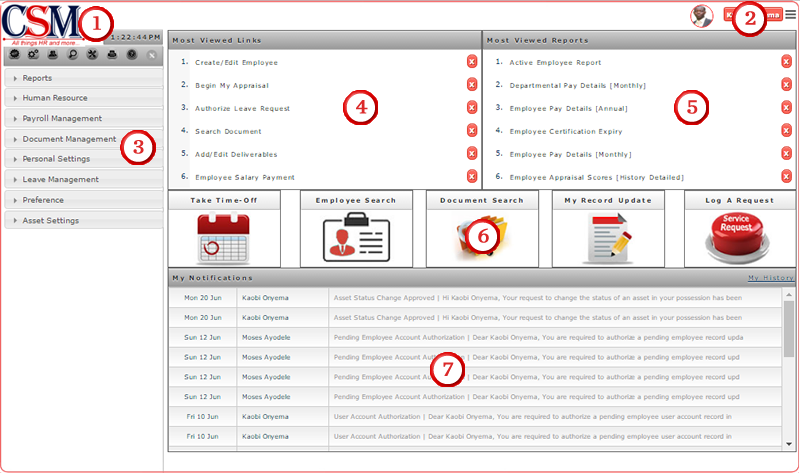 Hence you can have employees login an see only menus related to their daily tasks. Clicking on these menu’s displays sub menus which allows you carry out various tasks. Notifications: Here you find a list of all notifications for actions performed. All notifications here are also sent to your mailbox as an email. Now that we have a quick grasp, let’s take a deep dive. You are now presented with your organisational setup page. Here you would have to setup the name of the organisation and other key preferences. Setting up each job cadre and level is a key part of beginning your organisational hierarchy and level to which each individual would fall under. 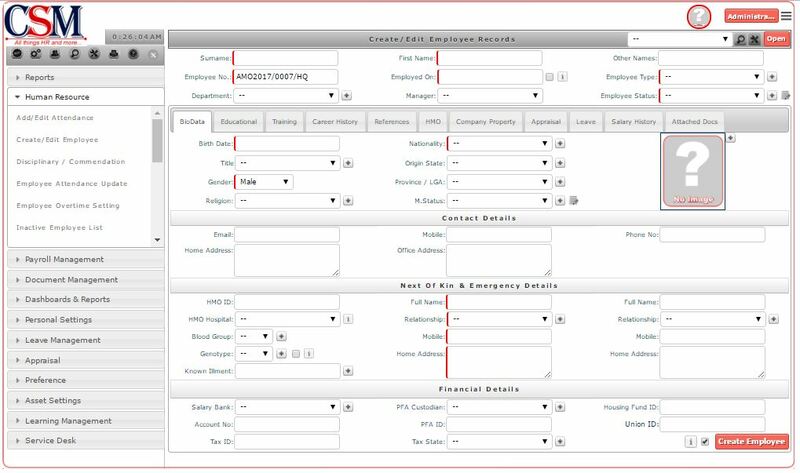 In our Day 2 of this course, we would return to this screen to setup Leave Groups and HMO Groups for each cadre of employee within our organisation. To begin, get a list of all cadre that is required to be setup in your organisation and begin entering them, from the highest of cadre band to the least. Start by defining each job cadre and the expected wage bill. Where there are multiple bands or steps as the case may be, have them clearly defined individually. The expected wage bill would help in reporting and analytics in future. 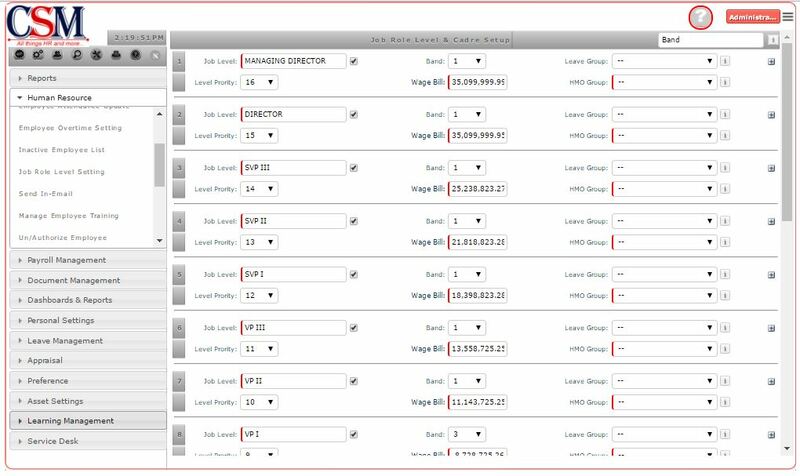 The list of values masters are values that you can select across various modules in the CSManager©HRMS solution. A good example is… A list of departments, employment types or titles etc… that you can pick from to quickly complete a form. Now you are ready to create your first employee – Yourself. Before you proceed however, it is worthy to note that this may not necessarily be the process to create all your employees. For starters, there are two basic methods of employee creation. You are presented with a screen with fields relevant to creating the employee. This downloads a sample file with the specific order of arrangement to aid your import. NOTE: You may require some basic technical skills to ensure this file is saved in CSV and the date fields are formatted right. Click on the Upload button to have the details uploaded. The uploaded details are formatted and presented to you for your final approval before import. Select all records you wish to import and click on the Import button to complete.